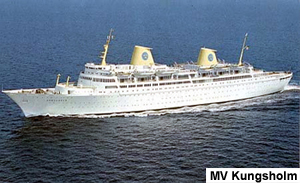 On 17th June 1978, the MV Kungsholm was the first cruise liner to visit Invergordon, and the only one in 1978. Following this there were one or two visiting cruise ships each year. The challenge in the early days was that the Navy still owned and ran the Admiralty Pier, and the Saltburn Pier was still owned and run by British Aluminium, therefore the Port could not guarantee a berth for visiting cruise liners. The Navy had control of the Admiralty Pier until 1993, but did agree some years before to allow the Port to guarantee visiting cruise liners a berth alongside. When the pier was sold to Bannerman’s in 1993 this gave the Port the opportunity to really start promoting its use – including for cruise ships. The MV Kungsholm was built on the Clyde in 1966 by John Brown & Company. During her career she had several names - MV Sea Princess, MV Victoria, MV Oceanic 11 and MV Mona Lisa. As MV Mona Lisa she visited the port six times between 2004 and 2010, including the last voyage before she retired in September 2010. In the twenty-three years between 1982 and 2005, 26,980 passengers visited Invergordon – an average of 1,173 people each year. 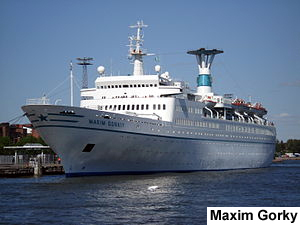 Maxim Gorky (8th August 1982 was her maiden call), Achille Lauro, Dalmaciya, Istra, Daphne and Europa, to name a few, were regular visitors during this time. In 1994, Statendam was the first ship to arrive carrying more than 1,000 passengers (1,289) and in 1995 the QE2 brought 1,585 passengers on her maiden call. 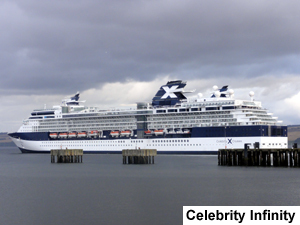 Season 2005 – 27 cruise liners, bringing a total of 27,000 passengers. 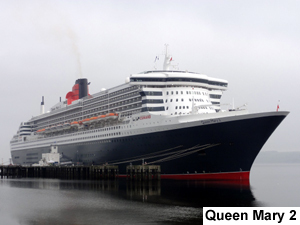 Queen Mary 2 brought 2,415 passengers on her maiden call. Season 2008 - 52 cruise liners, bringing a total of 48,100 passengers. This has led to an estimated boost of £8 million to the Highland economy. Season 2009 - 46 cruise liners bringing a total of 48,787 passengers to the area. 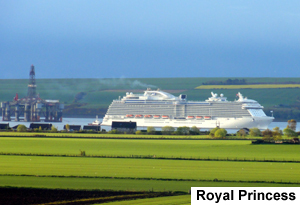 Highlights of the year included a maiden call from the 113,651 gross tonne Crown Princess, which on one of her calls brought 3,231 tourists, the largest number of passengers from a single cruise liner to visit Invergordon. The vessel visited another three times during the season. 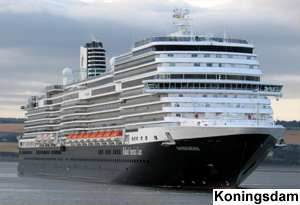 Season 2010 - 53 cruise liners - 60,328 passengers – 2.3 million gross tonnage. Highlights of the year included a further four visits from the 113,651 gross tonne Crown Princess, which brought an average of 3,100 tourists each trip. Season 2011 - 45 cruise liners - 73,325 passengers - 2.6 million gross tonnage. Highlights of the year included further six visits from the Crown Princess, eight visits from AIDA ships and a visit from the Queen Elizabeth. Season 2012 - 66 cruise liners - 78,529 passengers - 2,939,459 gross tonnage. Highlights of the year included a maiden call from the 112,894 gross tonne Caribbean Princess, followed by a further five visits, bringing an average of 3,050 passengers each trip. 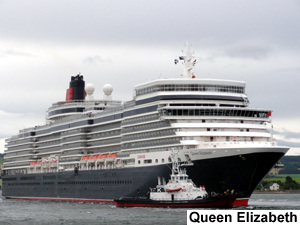 The Queen Elizabeth also visited and there was a maiden call for MSC with MSC Lirica arriving three times in total. Season 2013 - 64 cruise liners - 89,893 passengers - 3,504,047 gross tonnage. This amounts to 30% - 40% of Invergordon port’s total business tonnage and it was the third busiest port in the UK for transit calls behind Dover and Guernsey. Highlights of the year included a further eight visits from the Caribbean Princess, The Queen Mary 2 and Elizabeth also visited and there was a maiden call for MSC Magnifica arriving twice in total and for Celebrity Infinity arriving four times in total. Season 2014 - 56 cruise liners - 77,920 passengers - 2.9 million gross tonnage. Highlights of the year included a maiden call from the 113,651 gross tonne Ruby Princess, which visited nine times in total bringing an average of 3,200 tourists on each visit. 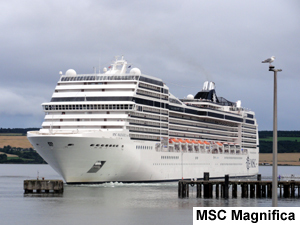 MSC Magnifica returned twice and Celebrity Infinity returned once. There was also a maiden call for Queen Victoria. Season 2015 - 55 cruise liners - 89,430 passengers – 3.5 million gross tonnage. Highlights of the year included a maiden call from the 142,714 gross tonne Royal Princess, which visited nine times in total bringing an average of 3,400 tourists on each visit. 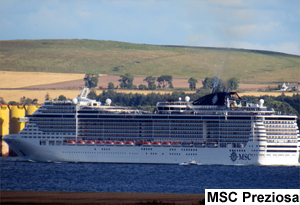 There was also a maiden call from MSC Splendida (137,936 gross tonnes) which returned a further four times. There was also a maiden call for Norwegian Star. Season 2016 - 64 cruise liners - 97,993 passengers – 3.6 million gross tonnage. The Port of Cromarty Firth welcomed more cruise passengers than any other Scottish port in 2016. 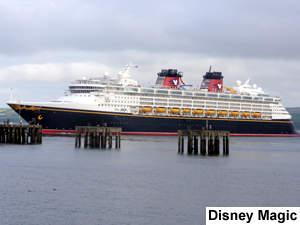 Highlights of the year included a maiden call from the 83,969 gross tonne Disney Magic, which visited once more during the year. There were also maiden calls from Zuiderdam (82,820 gross tonnes), Astoria (formerly Azores), Costa neoRomantica (57,150 gross tonnes), Pacific Princess (30,277 gross tonnes), Celebrity Silhouette (122,210 gross tonnes) and Koningsdam (99,500 gross tonnes) which was the 1,000th cruise ship to dock in Invergordon. This event was commemorated by a lunch, followed by a short tour of the ship, for invited guests. Each guest received a commemorative plate. Season 2017 - 93 cruise liners – 151,078 passengers – 5.6 million gross tonnage – a 54% increase on 2016 and generated over £15 million for the Highland economy. Highlights of the cruise season included a maiden call from MSC Preziosa (139,072 gross tonnes), followed by a further four visits and eleven visits of the Caribbean Princess which has now left our shores for the warmer waters of the Caribbean. 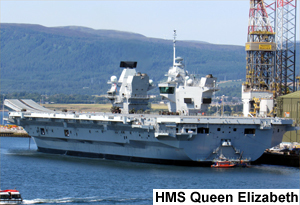 A different highlight of the season was the arrival of the new aircraft carrier HMS Queen Elizabeth which was undergoing sea trials in the Moray Firth during the summer. She was due to dock to refuel and take on supplies but ended up staying for a number of weeks due to technical problems. Season 2018 - 94 cruise liners – 163,000 passengers – 6.3 million gross tonnage, valued at £16 million in direct spend for the Highlands. 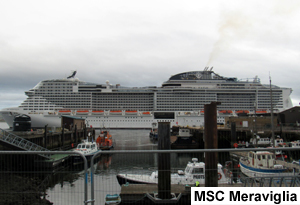 Highlights included the maiden call, and a further five calls, of MSC Meraviglia (171,598 gross tonnes), and inaugural visits from Viking Cruise Lines with Viking Sun and Viking Sky. We even had a visit from a ‘Rock Cruise’ when 2,000 leather-clad German rockers of all ages hit the town, some even with their very own version of Nessie (on dog leads)! Season 2019 – 106 ships – 177,000 passengers – 6.6 million gross tonnage. Season 2020 - 64 cruise liners already booked.